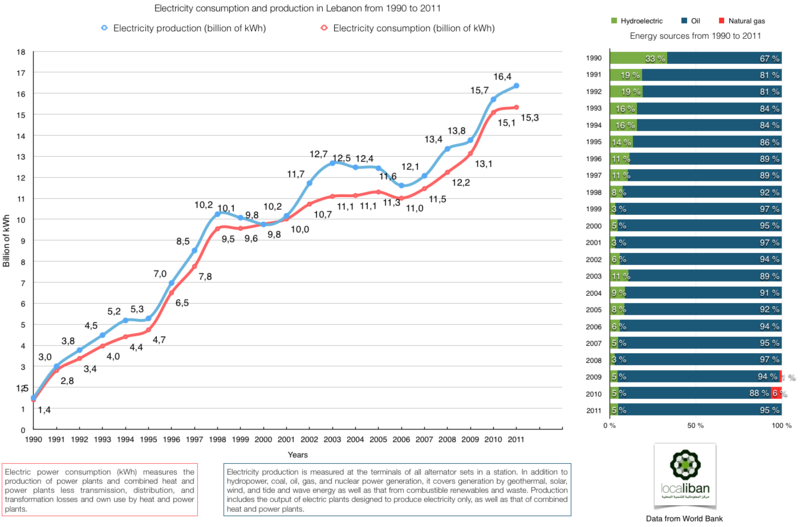 Electricity consumption and production in Lebanon from 1990 to 2011. Electric power consumption (kWh) measures the production of power plants and combined heat and power plants less transmission, distribution, and transformation losses and own use by heat and power plants. Electricity production (kWh) is measured at the terminals of all alternator sets in a station. In addition to hydropower, coal, oil, gas, and nuclear power generation, it covers generation by geothermal, solar, wind, and tide and wave energy as well as that from combustible renewables and waste. Production includes the output of electric plants designed to produce electricity only, as well as that of combined heat and power plants.